I train and compete in the Midwest, specifically in St Louis. I’ve been fortunate enough to compete fairly frequently and it was at one of these competitions, the IBJJF Chicago International Open, that I saw my first Quantum Kimono. I saw about half a dozen that day, many of them with Comprido/BRASA patches. The gis fit the athletes very well, especially the long and lanky ones. I’d never head of this brand before and was curious what they were about. A friend of mine is a brown belt under Comprido so with the help of a little Facebook stalking and I was able to track them down and beg them for their Comp gi to review. The kimono consists of a medium weight pearl weave jacket and cotton pants. The jacket is white with maroon contrast stitching. The jacket is a single piece of fabric and triple stitched at the seams. The collar is of average thickness and a little stiffer than average. The jacket is well-constructed as a whole. The pants are also triple stitched, well constructed and have a pearl weave gusset. The pants have reinforcements on the knee that start at mid-thigh and go down to about 12 inches from the cuff. Aesthetically the Comp is a very straight-forward gi. There is red contrast stitching, some red cotton tape at the side seams, a patch on the chest, one on the lapel and an embroidered logo. The chest patch is pretty large, 3.5”x8.5”, and could be easily removed with a stitch ripper is needed. The embroidery is on the left shoulder and consists of a stylized “Q”, ~2.75” in diameter, that is designed to look like a black belt was used to form the letter. 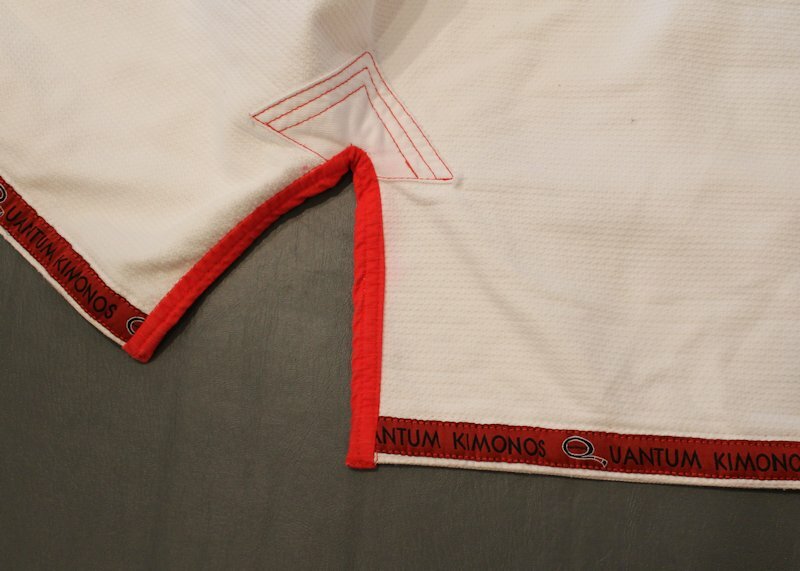 The inside of the “Q” is filled in with red and has “KIMONOS” written in it. The final patch is the ever-present manufacturer’s logo at the base of the lapel, its 1.5”x 2.75” and could be easily removed if desired. On the interior there is satin tape inside the cuffs and also inside the skirt at the base of the jacket. The satin tape is dark maroon and features the company logo and name. There is also a satin label inside the jacket at the neck with the logo and Chinese dragon’s head and the origin of the gi (Pakistan). Starting at the top and working our way down. The pants have an offset waist (the rear is about an inch higher than the front) and are held up with 6 loops and an elastic drawstring. The loops, drawstring and slit reinforcement are all red. The inside of the pants has a smaller version of the tag from the interior of the jacket. The only external adornment is previously mentioned contrast stitching, a patch on the upper right thigh and Quantum’s “Q” logo. The upper thigh patch is 1.5” x 2.75”, runs horizontally and has “QUANTUM” written in it. The embroidery is the same as the shoulder just larger, its ~4” in diameter. The cuffs of the pants are triple stitched and have the same satin stitching on the inside as the jacket. Right out of the box I noticed that this gi is made for tall guys. The wingspan, 71.5”, is among the longest of any gi that I own. When coupled with a cuff width of just 6.25” had made a sleeve that had plenty of length but is still hard to grab because of the dearth of material. I’ve dried it twice and it’s shrunk down a bit more. The chest and length are also great for those that are long of limb. The pants have plenty of length and like the jacket are actually cut for us leaner folks. For comparison the fit is very similar to the Manto “X” Pro Ultralight (A3) and Lucky’s Diaz Bros (A2L). The only down side is that I did get a little bleeding from the red trim when I left the gi in my washer for a few days without hanging it out. (BTW – This is not a good habit to get into). 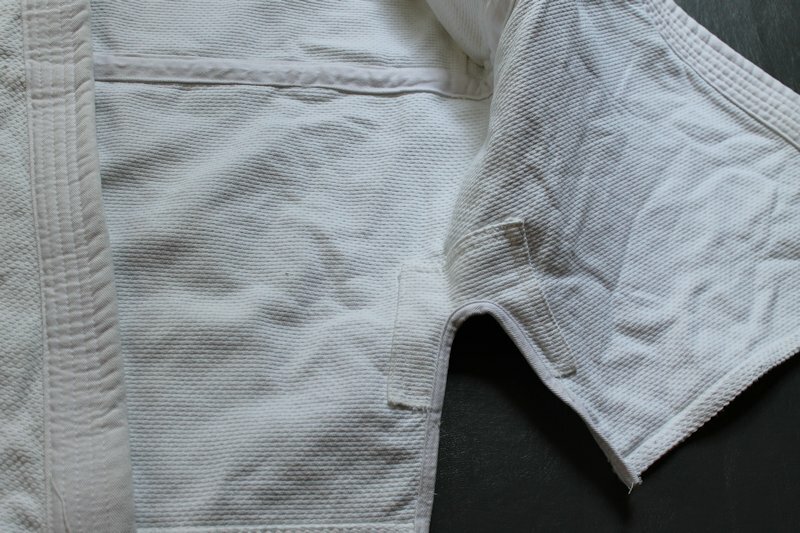 The stains came out almost completely with some stain stick and another wash. I’d also mention that I’ve seen about a half-dozen of these on competitors and not seen this on anyone else’s gi. Quantum is two guys up in Green Bay that got fed up with the insanity that has become synonymous with hard-to-find, limited edition gis. They did what many of you have probably dreamed about. They opened up shop, made exactly what they wanted and sold it to their friends and teammates. The fact that so many of their teammates wear them to competitions speaks well for Quantum Kimonos. 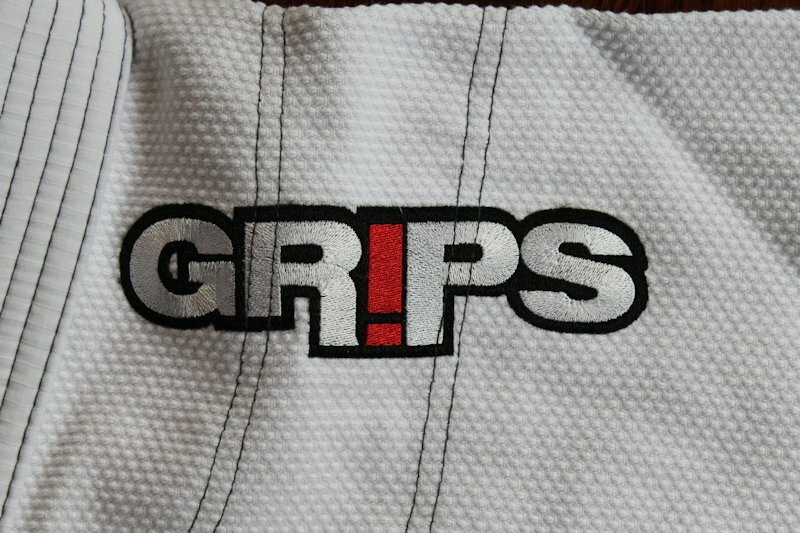 The Comp comes in at $149.00 which is right in the middle of the pack for a high quality gi. What may interest some of you is that their blue (the Nameless) and black (Ember) gis are also $149.00 which is below the typical price for a colored gi. At the end of the day this is a gi that fits me very well and one that will stay in heavy rotation for my training and one I’d consider for competing. It’s also one of the few gis that I’ve come across that’s going to fit someone with an 80+” wingspan. Do yourself a favor and check out Quantum’s website and Facebook for upcoming sales, promotions and more.